The Vancouver Condo Buzz » Launch of the Landmark Oasis Coquitlam Condo Tower by Onni Development Group – Central Coquitlam Condominiums for Sale at the Oasis High-Rise Residences – 38 Stories! Launch of the Landmark Oasis Coquitlam Condo Tower by Onni Development Group – Central Coquitlam Condominiums for Sale at the Oasis High-Rise Residences – 38 Stories! Located in the heart of central Coquitlam real estate market comes a landmark condominium tower by Onni Development Group. Here at the new Oasis Coquitlam condos for sale, homebuyers willl be treated to a glass/concrete high-rise of unparalleled luxury including spacious and well designed floorplans, impressive and detailed craftsmanship, lavish finishes and onsite amenities. The pre-construction Coquitlam Condos at the Oasis tower by Onni will stand thirty eight stories (38 floors) in height and will become the landmark condominium tower in the Coquitlam real estate market for generations. With schools, transit, green spaces, recreational facilities and an abundance of shopping just outside your door, the new Oasis Coquitlam condos for sale will be a residential retreat unparalleled by any other project on the market. In addition, you can become part of this bustling metropolitan area that is growing exponentially and drawing in millions of investment dollars, businesses, jobs and infrastructure. Not only that, but the new Coquitlam Oasis condos for sale will present a wealth of community amenities too, so that you can enjoy living as well as playing right here at Oasis. Find your Oasis today. Learn more about this impressive landmark Coquitlam condo tower today by visiting the Onni Development Group marketing website at www.oasiscoquitlam.com where you can register your interest for the VIP Preview and grand opening launch of presales. Get centered in the heart of the Coquitlam real estate community and never look back! This amazing new community is burgeoning with excitement and development, so be a part of this massive up-and-coming neighbourhood by purchasing a presale Coquitlam Oasis condo for sale today! Previewing soon with VIP pre-construction pricing, you can centre yourself in Oasis Coquitlam condo tower and discover what this beautiful city has to offer. Coquitlam is not only a hub for highway and bus transit networks, but you will also be just seconds away from the European inspired West Coast Express train into downtown Vancouver. Just 30 minutes between downtown and Coquitlam Center is your commute! Unbelievable! Coquitlam real estate community is one of the Lower Mainland’s most livable cities and it is thriving with all the development of retail, office space and industry that makes it so attractive for homebuyers. Affordable housing and various home types are what make this city generational. Directly next to the presale Oasis Coquitlam condos for sale are over one hundred and seventy five shops and services in Coquitlam Centre shopping mall. Being the crown jewel of Coquitlam real estate market certainly has its perks! The presale Coquitlam Oasis tower is soon to be the tallest residential condo tower in all of Coquitlam real estate market and was created as both an iconic building as well as an urban refuge, much like an oasis within a busy world. Towering 38 floors into the Coquitlam real estate skyline, the Oasis Condos by Onni Development Group is an architectural gem within the vibrant downtown area that offers everything you need to live life to the fullest year round. The desire to weave Oasis Coquitlam condos for sale into the fabric of this community as well as the natural environment extends upwards into each home here. Generous outdoor living spaces embrace homebuyers’ need to extend their living space outwards. In addition, floor to ceiling windows at the new Coquitlam Oasis condo tower will provide spectacular views of the city and beyond. Club Oasis by Onni is the building’s expansive amenity area, with an outdoor swimming pool and professionally landscaped grounds. There is no better presale Coquitlam condo release right now. Are you excited? Homebuyers will have a choice between 2 professionally chosen colour schemes that include the Mariner light oak Option A as well as the Lions Grey Teak Option B, which are both beautiful in their own way. The interiors selected by the Onni Development Group for the Oasis Coquitlam condos for sale will include impressive and contemporary twelve by twenty four inch ceramic tiling that will grace the floors in the bathrooms, kitchen, entry hall and laundry closet rooms. Also, there will be luxurious Berber style carpeting with trackless stain resistant qualities in the bedrooms. The living and dining areas of these new Coquitlam Oasis condos for sale will include durable laminate hardwood floors that are very elegant and timeless. All homes will have front loading EnergyStar energy efficient and water efficienty washer and dryer by a name brand as well as painted flat panel interior closet doors. The new Coquitlam Oasis condos will also present one inch horizontal Venetian blinds for privacy. The “opulent bathrooms” by Onni for Oasis Coquitlam includes such finishes as white 12×18” glazed porcelain tile tub/shower surround, clean and minimalist undermount sink with modern single lever faucet in addition to contemporary large format imported 12×24” ceramic flooring. The ensuite bathrooms at the new Coquitlam condos at Oasis by Onni will also feature vertical grain laminate cabinets with stainless steel pulls (dependent on your colour scheme of choice) in addition to striking polished composite counters with a four inch backsplash. Also, homebuyers will love the comfortable minimalist bathtub and/or glass enclosed shower stall with pressure balanced controls. As for the kitchens at the Oasis Coquitlam condominiums, homebuyers will also be very happy with the sleek polished countertops (composite finish) and some floor plans have extended breakfast bars. All kitchen and bathroom cabinet doors and drawers will have the ‘soft close’ mechanism so there will be no banging in your home. The new Coquitlam condominiums for sale will also have functional task lighting, full height, small format grid laid ceramic backsplash tiling and restaurant style kitchen faucet with pull out spray. Also available in the gourmet kitchens at the Oasis Coquitlam condominiums now selling are undermount stainless steel double bowl sinks with garburator and laminate cabinetry in Light Oak or Grey Teak (again, to do with your colour scheme). All homes will also have four premium KitchenAid stainless steel appliances that include a large EnergyStar fridge/freezer, dishwasher with the Whisper Quiet Sound Insulation System, microwave (built in with hood fan), gas cooktop and wall oven with Even Heat True Convection System. Some of the incredible building features at the presale Coquitlam apartments at Oasis by Onni include solid reinforced concrete construction of the highest grade offering superior and unmatched quality, durability, ease of maintenance and quiet living! Also offered are pre-wiring for security systems in suite, fire sprinkler system in all homes and common areas as well as the 2-5-10 year home warranty. Also, homebuyers at the new Coquitlam apartments at Oasis Tower will have convenient and secure key-fob proximity reader and floor specific access for additional safety and lobby enterphone with security camera. Last but not least, the Oasis Coquitlam apartments for sale will have a well lit underground parking garage with video surveillance and security gates. Located in the heart of Coquitlam real estate market place and standing thirty eight stories high, Oasis Coquitlam condominiums for sale is the new landmark high-rise tower in this growing city. With shopping, schools, transit, parks and recreation just steps away, paried with a long list of amenities, the pre-construction Coquitlam condos at the Oasis Condominium tower will be a residential retreat within the bustling metropolitan centre. The promise of urban proximity is coming soon to the Coquitlam real estate market. Developed by Onni. WITH THE PROMISE OF URBAN PROXIMITY here at the Oasis Coquitlam condos for sale that include 1-2 Bedrooms, a Penthouse Collection & Extensive Amenities in the Coquitlam real estate market. A landmark presale condominium tower in the heart of Coquitlam real estate market standing 38 stories tall within close proximity to shopping, transit, and parks, Oasis Coquitlam tower is a residential retreat within a bustling metropolis. One and two bedroom presale Coquitlam Oasis condo homes, penthouses and lush amenities just steps from Coquitlam Town Centre! Offering the promise of urban proximity in the heart of the Coquitlam real estate district, Oasis Condo Tower introduces one and two bedroom condos for sale plus an exclusive collection of luxurious penthouse suites. This landmark Coquitlam condo tower at Oasis is located in the heart of this growing city and will stand 38 stories tall, becoming the tallest high-rise building in the area. Just steps to shopping including the Coquitlam Town Centre, public transportation and public parks, Oasis Coquitlam condo tower is a residential retreat within a bustling metropolis. Priority register today online to receive more information about this outstanding real estate opportunity from well known Vancouver based builder Onni Group by visiting www.onni.com today. 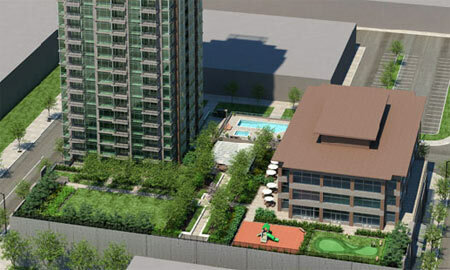 This is just a sample of the new Coquitlam Oasis condos now selling. Construction has commenced at Oasis Coquitlam real estate development and we are getting ready to go up! This is your last chance for Coquitlam pre-construction prices! With pre-construction prices starting from just $235,900 this is Coquitlam real estate’s best value! 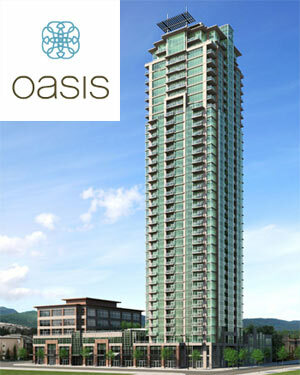 For more information, visit us online at www.onni.com or speak to an Oasis new home consultant by calling 604.461.2750. We look forward to hearing from you, The Oasis Sales Team – Tri-Cities New Home Centre is located now at 2950 Glen Drive, Coquitlam (Located directly across from Coquitlam Centre). * The Oasis Coquitlam condo prices are subject to change without notice. E.&.O.E. Prices reflect net HST. Rebate may vary per individual sale. Please speak to Onni Sales Representative for more details.